An Impossible Invention on Amazon — second edition upcoming | Mats Lewan: The Biggest Shift Ever. 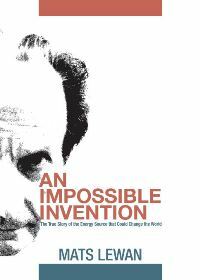 Lots of people have asked me to make ‘An Impossible Invention’ available on Amazon in order to reach a broader audience. So I did — now there’s an e-book version in Amazon’s Kindle format listed here. I’m now working on a second edition of the book with minor updates and corrections. A more detailed examination of the legal saga of Andrea Rossi will be added, as well as an update reflecting the findings about the company Defkalion’s technology, revealed in early 2014. I’m also waiting for the upcoming third party report on Rossi’s E-Cat, which is expected to be published shortly, in order to include this report and comments on it in the second edition. As soon as the new edition is ready it will be available on Amazon, initially as an e-book, and later also as a paperback through a print-on-demand service. The support I have received from all those who have ordered the book so far, and through all emails, phone calls and overwhelming reviews, has meant a lot to me, and I’d like to offer everyone who has read the first edition a free download of the second edition as an e-book. If you ordered the book through Animpossibleinvention.com you will receive an email with this offer, once the second edition is published. Thank you, Mats, for producing such gripping page-turner and also a marvelous piece of literature. I have stumbled on Andrea Rossi only this September. Paradoxically it is significantly also because you have done such marvelous job in writing it! Reading It should become essential starting step to overcome the difficulty in catching the glimpse the giant who is Andrea Rossi. There is time needed for the next step! I wish you a good fortune in helping us with it. Thank you. e lo dici anche chiaramante che è una frode, oppure anche questa volta te lo tieni per te? Com’era la stanza in cui testavi l’Hyperion, Mats? Fresca abbastanza? Pietro, basta la seconda. Contiene tutto della prima. scusa Mats, ma per avere la storia completa dovro’ comprare le due edizioni o basta aspettare che esca la seconda? Grazie. Hey, you can’t lose. If Rossi crashes, you can always reprint the book with the trial deliberations and the sentence! That’s fantastic. Hope there is a timeline in there! Thanks. I anticipate a good report, given the experiences they’ve learnt from the first report. Thank you Mats for your steadfast position in this stormy story and likely biggest shift ever. I look forward to your 2nd addition. I purchased the first edition of Mats book and I loved it. Mats shares with us a real interest for this strange and mysterious Rossi’s device. It was objective and revealed many details including also the device test failures. I wish to thank Mats for the book and for the gift of the free second edition.